If it's not abundantly evident by the contents of this blog. I'm a pretty open book. Despite my numerous insecurities over the years, some of which I still struggle with, I'm relatively comfortable discussing who I truly am, faults and insecurities and "issues" and all. In fact, it's when I am able to have these conversations, to broach these deeper internal subjects with others, that I feel most comfortable. I'm pretty awful at small talk. I don't have anything against it in theory, I just am really awkward at it. And while I'm relatively used to feeling awkward by now and joke about it plenty, it's not my favorite feeling, as you might imagine. I've simply come to grips with reality. The point of all of this is to say, I'm OK with being myself. My awkward, depressed, anxious, introverted, mood cycling, geeky, dorky, tomboy-ish, uncoordinated, deep thinking, vastly lost in the imaginative world, self. I often quote Charles M. Schultz in saying, "Be Yourself. No one can say you're doing it wrong." And I live it every day, at times to my detriment. So when someone says something to me like, "You'll be fine, just be yourself", I take them literally. In doing so, I know one of two things is likely to happen: either this person genuinely likes me for my real self and means it, or it's going to be a disaster. The problem with "be yourself", as it's ubiquitously used these days, is that it's become cliche. People say it without thinking about all of your "you" characteristics and how they may fit into the specific situaiton. Additionally, they think that when they say "be yourself", that you automatically understand that there are certain parts of "yourself" that are acceptable in this situation and others that are not, and that you can and will easily hide those parts that are not. Basically, they expect you to telepathically intuit the version of yourself that they expect you to be in the given situation. Now, in some cases, this is probably rather common sense. For instance, just because you enjoy stand up comedy does not mean you stand up and tell jokes in the middle of grandma's funeral. But in other cases, what they assume and expect may not be as easily discerned, or as simple for you to do. Let me give you an example: I'm invited to a party where there are going to be a ton of people, none whom I know apart from the party thrower. There will be loud music and lots of alcohol, which comes with the expectation that everyone will be getting drunk. Meanwhile, I'm an introvert with social anxiety and say, for example's sake, I'm in the middle of a rough depressive cycle. I get overwhelmed with large crowds and excessive noise, and drink much these days for health reasons. Let's add in that I have to drive home, so even if I wanted to "let my hair down", I really couldn't, at least not when it comes to joining in the drunkenness. But my guess is, that when the party thrower says "be yourself", they assume I'm going to be at ease and participate in the party as they would - because naturally, having fun and drinking and talking to lots of people in a large crowd with loud music is what everyone does at a party, right? And if not, it's what they should be doing. 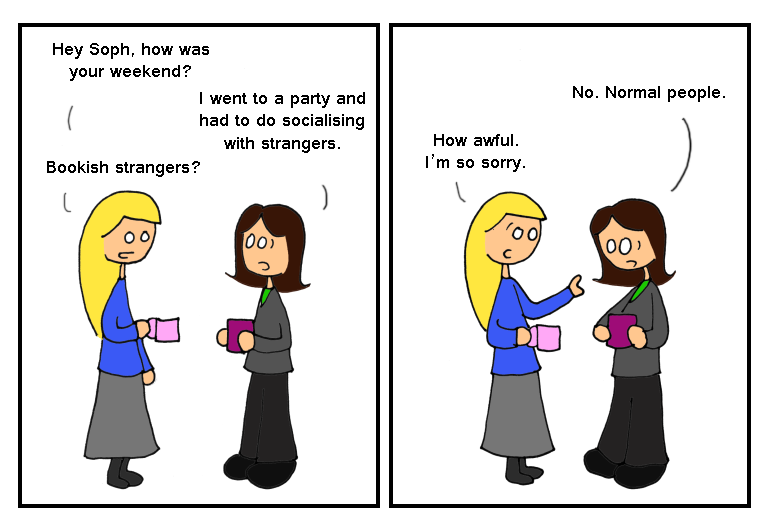 It's the social norm, after all. But in actuality, if I'm myself, I'll stand quietly in the corner, sipping a soda, nervous to talk to anyone and desperately hoping there's a dog I can play with so that I can avoid interaction by pretending I feel sorry for the dog who's not getting enough attention. What's worse is that the party host, who knows me well and who extended the invitation telling me to be myself, is both surprised and upset by my level of participation (or lack thereof) in the traditional party festivities. They somehow expected me to turn into an extrovert who loves crowds, gets crazy at parties, and fits right in, despite the fact that my natural self, which they told me to be, indicates everything to the contrary. They then say things like "why can't you just relax and have fun?" And I have to explain to them that big parties with lots of noise and strangers and alcohol that I'm expected to, yet for numerous reasons can't. consume, are neither relaxing or fun to me. They don't understand, because these things are fun to them and others and therefore I should be able to have fun doing these also. I get more frustrated with them for imposing their standards on me. And the cycle goes round and round. Introverts and extroverts can get along. 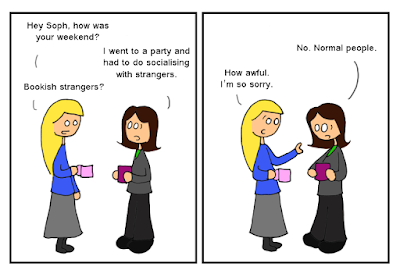 Socially anxious and socially comfortable people can get along. Those with depression and cycling and those without can get along. But to do so we must understand that what's fun and relaxing to one group may well not be to another. We can't make book club any more exciting for you, so why is it fair to expect us to have a great time at a party that makes us anxious? Instead, perhaps see if you can appreciate that we've tried. That you were important enough to us that we put ourselves in an uncomfortable and anxiety producing situation because you said you really wanted us there. In fact, you said you wanted us there and to be ourselves. So we went. And we were ourselves. We did exactly what you asked. We just didn't enjoy it. Nor was that ever part of the deal, at least not to us. To you, it was implicitly understood. The bottom line is, if you want us to be ourselves, then by all means tell us. But if you want us to be something else, let us know what exactly that is. This doesn't mean we will, or we can, but perhaps we can come to a compromise. Perhaps we can say, "I'll come to the party. I'll try my best to meet strangers. I can't promise I won't be awkward, but I'll not hide in the corner petting the dog all night (ok I'll probably pet the dog but not in the corner and not all night)." And you can say, "I'd really appreciate that. It means a lot to me that you're even there and trying because I know how difficult it is for you. I don't expect you to be the life of the party, I understand if you can't drink, and if you only stay for a little while. I'm just glad to have you there at all." And maybe we're not all 100 percent happy. But at least we're not both 100 percent miserable.